President Obama hugged nurse Nina Pham. BETHESDA, Md. (AP) — A nurse who caught Ebola while caring for a Dallas patient who died of the disease walked out of a Washington-area hospital virus-free Friday and into open arms. 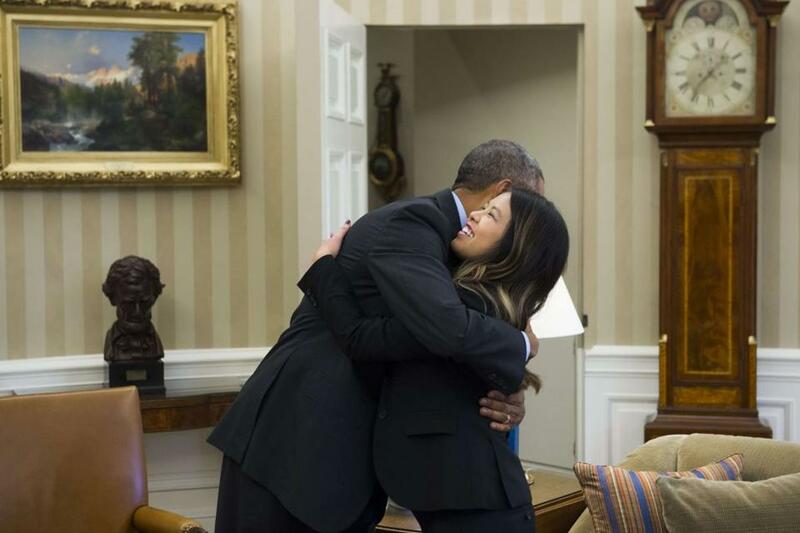 Nina Pham got a hug from President Barack Obama in the Oval Office at the White House. Outside the hospital where she has been since last week, she got hugs from one of the doctors who oversaw her care. White House spokesman Josh Earnest called the meeting with Obama ‘‘an opportunity for the president to thank her for her service.’’ But the close contact between the president and the former patient also came as officials in New York tried to calm fears after a doctor was diagnosed with Ebola in that city. Pham said she felt ‘‘fortunate and blessed to be standing here today,’’ as she left the National Institutes of Health’s Clinical Center in Bethesda, Maryland, where she had been since she arrived Oct. 16 from Texas Health Presbyterian Hospital Dallas. ‘‘Although I no longer have Ebola, I know it may be a while before I have my strength back,’’ Pham said at a news conference. ‘‘She is cured of Ebola, let’s get that clear,’’ Fauci said. ‘‘I ask for my privacy and for my family’s privacy to be respected as I return to Texas and try to get back to a normal life and reunite with my dog Bentley,’’ she said, drawing laughter with the mention of her 1-year-old King Charles spaniel. Bentley has been in quarantine since Pham’s diagnosis but has tested negative for the virus. Pham is one of two nurses in Dallas who became infected with Ebola while treating Thomas Eric Duncan, who traveled to the United States from Liberia and died of the virus Oct. 8. The second nurse, Amber Vinson, is being treated at Emory University Hospital in Atlanta, which on Friday issued a statement saying she ‘‘is making good progress’’ and that tests no longer detect virus in her blood. Associated Press writers Lauran Neergaard and Jim Kuhnhenn in Washington contributed to this report.